I hadn't paid much attention to the release of Gloria Steinem's "My Life on the Road" when it was first release. I wasn't even interested when I read that Emma Watson chose it as the first pick for her feminist book club Our Shared Shelf. Then recently, I listened to an episode of the NYPL podcast that featured a discussion between Gloria Steinem and Roberta Kaplan, the lawyer who argued and won U.S. v. Windsor, the landmark marriage equality case overturning the Defense Against Marriage Act. Their 95 minute conversation covered a huge variety of topics and was remarkably inclusive - opening up the mic to audience members who wanted to ask questions and share their own stories. After finishing, I was proud and inspired, and put Steinem's book on hold. Prior to reading her memoir, I was vaguely familiar with Steinem as an important figure in feminism, as someone worthy of respect and admiration for all she had accomplished. But I had never read her writing directly or heard her speak. I was struck in listening to the NYPL podcast in how inclusive she was in her conversation, inviting others to tell their own stories and looking to the audience for answers. This is an approach she has followed throughout her life. Her memoir is full not only of her own story, but of the stories of others with whom she has interacted or worked closely. In reading this book, of course I learned about Steinem and her approach to feminism. I also learned about the massive influence of Native American cultures on the founding and continued history of the United States and the internal dynamics at play in the feminist movement writ large. Upon finishing this book, I recommended it widely. Then the Sanders comments broke. I still stand by my recommendation and greatly admire Steinem, with a reservation in the spirit of her inclusive approach: This is her story, and her approach to feminism. You may not agree entirely with her approach or politics, but her view is worthy of consideration. Verdict: Affirmed. This memoir provides a jumping off point into feminism for those unfamiliar with the movement in the US since the 70's, as well as a view to consider in dialogue with your own. 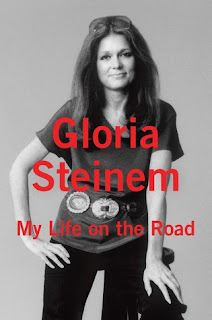 "My Life on the Road" by Gloria Steinem, published October 27, 2015 by Random House. Audio narration by Debra Winger, published October 27, 2015 by Random House Audio. Willowdean Dickson is a high-school student living in a small, pageant-obsessed town in Texas. She owns that she is a fat girl. She refers to herself as such, and is comfortable with who she is and how she looks. She lives with her mom, a former pageant queen; works at a fast food restaurant with a good-looking; and shares her passion for Dolly Parton, imparted by her recently-deceased aunt, with her best friend Ellen. In homage to her aunt, Willowdean decides to challenge her town's conventional standards of beauty and its social structure by entering the town's beauty pageant. As Willowdean prepares for the pageant and navigates the major relationships in her life, she questions who she is and has her confidence shaken. "Dumplin'" is the story of Willowdean reclaiming her confidence, deciding the type of person she wants to be, and essentially growing up. Other reviewers have criticized this book for its focus on the bodies of other characters, painting Willowdean as overly judgmental for someone aware of how others judge her. Maybe I was too absorbed in my own blissful enjoyment of the novel, but these instances didn't stand out to me until I read these reviews. Willowdean's observations and commentary on other characters struck me as no different from those of any skinny character in any other book set in high school. Everyone should aspire to be less judgmental, of course, but Willowdean is a human character who judges those around her. Her running commentary made her feel relatable and provided insight into how she sees the world around her. She grows as a character throughout the book, and while not every aspect of her personality should be emulated, on the whole she is still a positive role model. 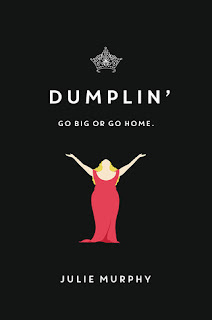 The novel is frank about issues of body image and confidence that are not frequently discussed in other YA novels. Willowdean is an interesting, inspiring access point to understanding one perspective on handling these issues. Verdict: Affirmed. I loved this book, even if I knew where it was going for much of the novel. Willowdean was a fresh, relatable protagonist & I recommend this book widely to YA fans. Transgender rights have been in the spotlight recently, with brave individuals stepping up to claim the everyday rights they need. Things many of us don't think about, like access to a bathroom that makes us comfortable and wearing clothes that make us feel confident, can be battleground issues for transgender individuals. "Becoming Nicole" has been published at an opportune moment, and is a much-needed introduction to transgender issues with a strong, compelling young woman at its center. Nicole Maines was born Wyatt Maines, twin brother to Jonas and adopted child of Wayne and Kelly Maines. From a young age she preferred traditionally feminine toys and identified as a female. "Becoming Nicole" follows young Wyatt's transition to Nicole, and how her family struggled to understand and support her. The Maines family is remarkably open about the difficulties they faced, both as individuals understanding Nicole's identity, and as a family combating the misinformation and prejudice from others outside their family. "Becoming Nicole" weaves scientific studies and historical background into Nicole's story, providing context that places her story among a larger societal struggle to understand transgender people and an ongoing fight for their basic rights. Nicole and her family are admirable, inspiring advocates, and this book is an important read for anyone who wants to understand what it means to be transgender and the challenges faced by this community. Verdict: Affirmed. Anyone who is interested in transgender rights, or even civil rights broadly, should read this book. Bonus points because the audio narration is superb. 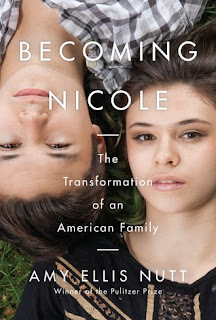 "Becoming Nicole: The Transformation of an American Family" written and narrated by Amy Ellis Nutt, published October 20, 2015 by Random House. I was a fan of Gayle Forman's "If I Stay" and its sequel "Where She Went," so when I learned she has another duology, I was excited to jump in. Lighter than "If I Stay," "Just One Day" remains a charming YA romance and self-exploration story. Allyson's parents give her a trip to Europe with her best friend as a high school graduation present. Always the good girl, she's not as interested in going out to bars or anything beyond the sanctioned activities of the tour group. Until she meets Willem on her train to London for the last leg of the trip. Allyson follows him to Paris, and is swept up in a single day of romance. Yet when Willem disappears, she questions her decision and returns home a different person. So let me be upfront with my single, but very large criticism of this book. The premise is absurd. Do not abandon your best friend on a train to London so you can go spend 24 hours in Paris with a guy you just met. That is an abominably dumb decision, and Allyson really should have known better, despite her recently-unearthed desire to live a little more than she had been. But going into this book, you know that's what she does. So I was willing to suspend my disbelief and give this a chance, accepting it for the implausible love story it is. And beyond the love story, it's really much more. The day in Paris is just the first part of the book. When Allyson returns home, she has to grapple with a difficult transition to college, figure out how to fit in in a new environment, and figure out who she is and who she wants to be. As she discovers more about herself, she is determined to go back to Europe and find Willem. The finding Willem part, again, not a great life choice, but I can get behind going back to Europe as a goal to work toward over summer break. While Allyson is a problematic character, and possibly not a great role model in terms of romantic-decision-making for high school kids about to head off to college and/or Europe, I enjoyed her journey toward self-discovery and her commitment to her goals. She develops a strong work ethic and figures out how to navigate (non-romantic) relationships in a way that is admirable, and likely helpful to readers at a similar point in their lives. Moreover, it's a fun read if you can just accept the premise and move on. Verdict: Affirmed, I enjoyed this book a lot as a fun piece of fluff, though I would certainly dismiss it as a manual for making smart life decisions. I'm happily moving on to the sequel to see what Willem was doing all this time. 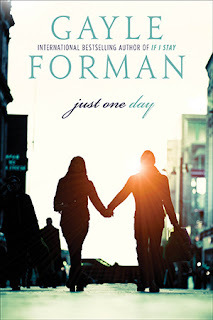 "Just One Day" by Gayle Forman, published January 8, 2013 by Dutton Books for Young Readers. Audio narration by Kathleen McInerney, published January 3, 2013 by Listening Library. "Fairest" is a bridge novel in the Lunar Chronicles, set (and released) between books 3 and 4, "Cress" and "Winter." It tells Levana's back story, and what a back story it is. Levana was raised on the moon, the second daughter of the royal family. Her parents die when she is a teenager, and her cruel older sister Channery becomes queen. Meanwhile, Levana is enticed by the prospect of ruling herself, and falls in love with a married palace guard. Though Levana's upbringing is horrible - absent parents and an abusive sister, never mind the additional pressures of palace life - she is nevertheless absolutely bonkers. She's cruel and sadistic herself, likely a combination of learned behaviors from her family and some sort of innate, inherited trait. She has her own brand of insanity, subtly different from her sister's and indifferent to the needs and desires of others. This story does not attempt to make you sympathize with Levana's crazy. You may understand it, and her, better at its conclusion, but it did not make me like her. It's a hard line to walk, but Meyer walked it well. 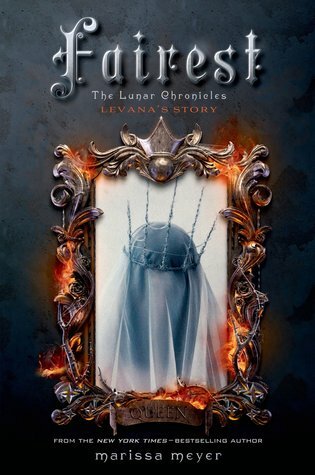 I hated Levana, but wanted to know what she would do next & why she takes the actions she takes in the main series. This novel gives her back story, fills in the gaps, tells you what's under her veil, literally and figuratively. Yet, her image as a contemptible evil queen is intact, and you can continue rooting against her for the final novel in the series with a deeper understanding of who she is and why. Verdict: Affirmed. The insight into an awful character with a mysterious background builds upon the solid foundation laid in the main series, and I'm sure the insights gained here will only add to my enjoyment of "Winter." "Fairest" by Marissa Meyer, published January 27, 2015 by Feiwel & Friends. Audio narration by Rebecca Soler, published January 27, 2015 by Macmillan Audio.